The Airport Amusement Park is another mystery park with just a few years of identifiable articles. The park was also called Airport Park in press, which makes finding information more difficult. But, there is a rather famous story of an elephant that escaped the park that terrorized the locals for more than a week. I found articles that dated from 1950 – 1959 that mentioned the amusement park. 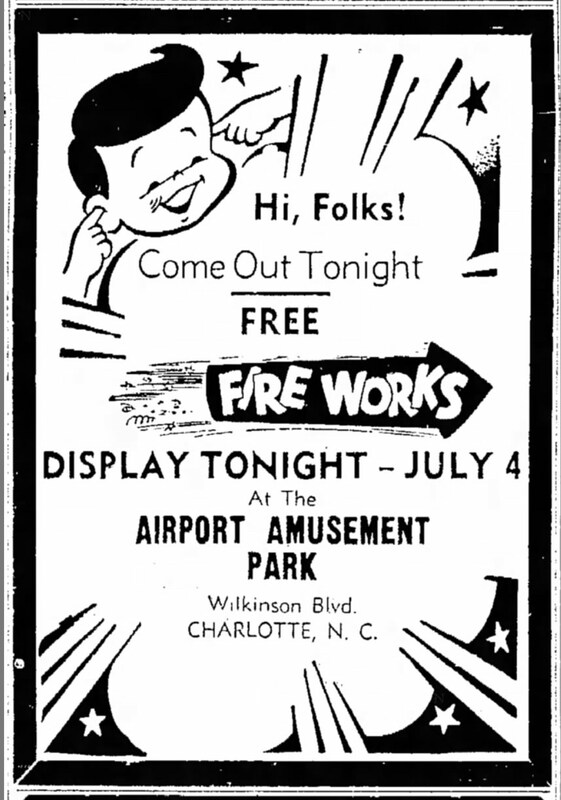 The Airport Amusement Park was located on Wilkinson Blvd. in Charlotte and seemed to be a small park with less than dozen attractions. One article states that Jack Partlow was the owner and operator of the park. The same article, from 1954 states that the 12th annual orphans day was a success. So, that means that the park was in operation by 1942. Possibly earlier. I found a final article about the park that mentions Barney Partlow as the owner and Jack, his nephew, as the manager and part owner. A.L. Lord is mentioned as buying animals for the zoo at the park in 1951 (Billboard). 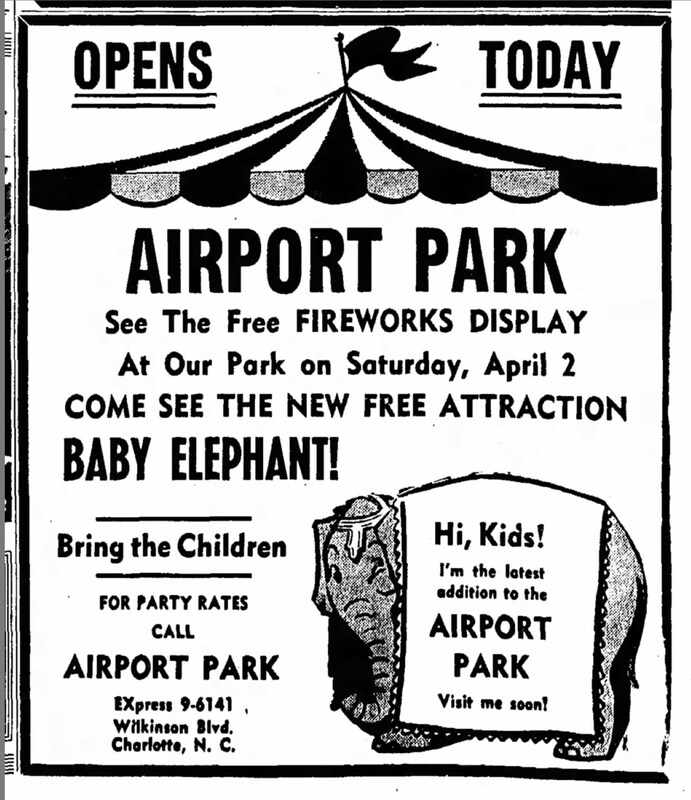 The April 14, 1950, Gastonia Gazette newspaper featured an ad for the grand opening of Airport Park (assuming this was just the opening for the season). You could see the zoo, big steam train, Dive Bomber, kid land, Octopus, Tilt & Whirl, Ridee-o, Merry-Go-Round, Ferris wheel, and fireworks. There was acres of free parking and courteous attendants. The October 7, 1950, Billboard features a nice blurb about a weekly radio show that is tied into the park and offers contests and reduced ride tickets at the park. It’s noted that over 2,000 requests for club badges and certificates were received during the first four weeks of the program airing. “The funspot sponsors a weekly 15-minute stanza on Charlotte’s WBT to air its Tiny Town program, with Fred Kirby, hillbilly musician and disk jockey, as ‘mayor’. Program plugs good citizenship for kids through pledges, slogans and rules. Partlow is ‘Uncle Jack’ on the program. 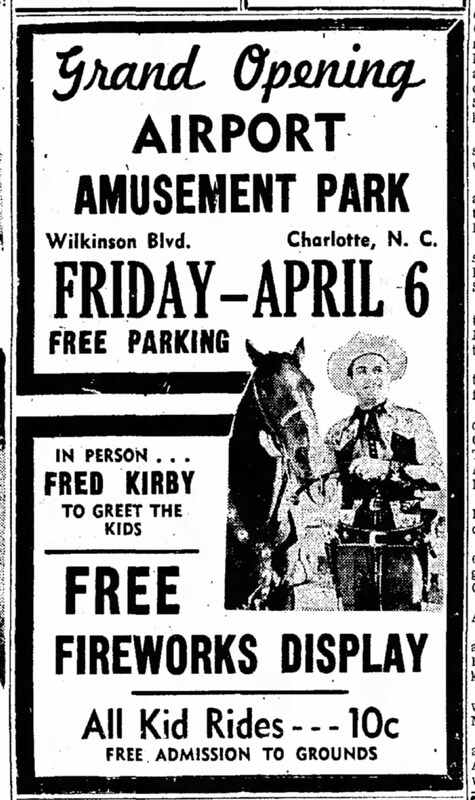 Kirby is on hand at the park on Saturday afternoons to greet the kids.” – Billboard, October 7, 1950. The earliest articles that I found mentioned the annual orphans day, also called Home Day. By most reports, Sheriff Charlie Rumple (Iredell County) escorted and hosted anywhere from 100 to 350 orphans from the Charlotte, NC, area. The 1954 article (Statesville Daily Record) states that Partlow “turned the entire grounds, including some 10 different rides, a skating rink and zoo over to the children of all ages.” The kids were also offered ice cold soft drinks, ice cream and pop corn. 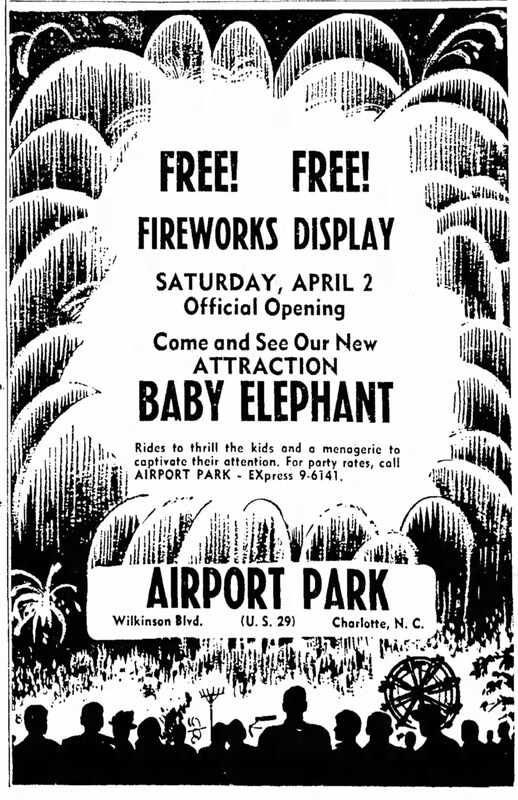 The Gastonia Gazette printed an ad on March 18, 1955 that shared the new attraction: the baby elephant! The baby elephant, eventually named Vickie, would gain nationwide attention in the fall of 1955. 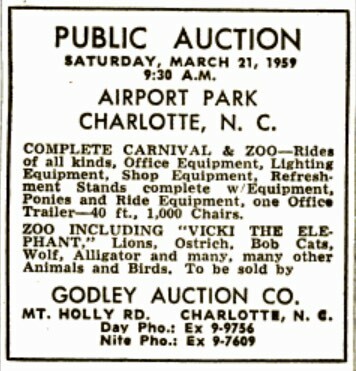 The April 2, 1955 Gastonia Gazette interviewed Jack Partlow who recounted the animals and rides available a the park. He states there are chimpanzees, bears, ant eaters, reptiles, and fowl of all types. For rides, there are the merry-go-round, Ferris wheel, kiddie auto ride, boat ride, Sky Fighter, whip, roller coaster, Octopus, Tilt-a-Whirl, Rolloplane and “many others”. Billboard from 1953 states that the Fearless Stars, a high contortion trapeze act, will perform for a week at the Airport Amusement Park starting May 24, 1953. Vicki the Elephant Escapes from Airport Amusement Park! For 10 days, Vicki the elephant garnered national headlines as she evaded capture in the wooded marshland near the amusement park. On Sunday, September 11, 1955, Vicki was being transferred to the Spindle-Center Fairgrounds when she escaped from her handlers. On the fourth day of the elephant hunt, Vickie wandered into the Pilot Trucking Company freight yard. Several truckers attempted to box her in with six different tractor trailers. Unperturbed, Vickie lifted the wire mesh with her trunk and attempted escape. Her trainer, John Smoky Strickland, used an elephant hook to stop her and she flung him aside. Strickland wasn’t hurt. Word made it to the local National Guard that the low-flying airplanes from the nearby airport were bothering Vickie, so the Guard grounded its planes until she was captured (or sadly) shot. Several other elephants were brought to the area to try to calm and coax Vickie back to her handlers, to no avail. Advertisement from the September 22, 1955 Rocky Mount Telegram. The Rocky Mountain Telegram reported that Vicki was run down by a volunteer posse of off-duty police men and volunteer firemen on September 20, 1955. They herded her into an open field and surrounded her with rope until she was fenced in, more or less. She walked back to the amusement park while Strickland and Partlow soothed her. You can read a wonderful recount by Charles Kuralt of the capture. Kuralt wrote for the Charlotte News during the time. In the local gossip column, Jas. (James) W. Atkins purports that “the whole story about Vickie the elephant was one of the smoothest publicity stunts ever pulled off here. Now that the fair is over, we expect to see her promptly ‘captured’ and returned to her station at the Airport Amusement Park.” (Gastonia Gazette, September 20, 1955). Was it a publicity stunt just to garner attention? “Vicki” has been incorporated for the owners of the runaway elephant to take advantage of her newfound popularity. Jack Partlow, B.F. Partlow, and Howard Robbins, all associated with the Spindle-Center Fair, have organized a corporation under the name of “Vicki” to manufacture and deal in foods, emblems and advertising. They plan to make T-shirts with Vicki’s picture and name blazoned across the front. The new company will also go under the name Vicki’s. The elephant “Vicki” escaped from the Airport Amusement Park recently as her handlers were loading her on a truck for a trip to the Spindle Center Fair. She was loose 10 days, and attracted national attention before she was caught. Now “Vicki” is back at the Airport Amusement Park zoo. What Happened to Vickie the Elephant? According to an article on the Charlotte Creative Loafing site, Vickie was sold to E. Pat Hall (of eventual Carowinds fame) in 1957 and he moved her to a Hickory amusement park (Lake Hickory Park?). Sadly, due to her captivity, the 9 year-old elephant never acquired the hard feet of most elephants. It is surmised that she got an infection during her 1955 sojourn that led to her death in 1958. Another article from The Caldwell Journal states that Vickie was sold to A.L. Lord and she was moved to Granada Farms Zoo in Granite Falls. Sadly, she was euthanized for the infections and was buried at the zoo, which was turned into a golf course in 1973. Apparently, Vickie rests under the third fairway. At the end of this post, I re-printed the lyrics to a 1955 song written about the elephant that ran away from the Airport Zoo. In the ad above, the photo states that kids can meet Fred Kirby. Kirby was a radio and television star with WBTV in Charlotte. He also had two country & western hits after World War II. Kirby had various kid shows with a cowboy theme. He also spent many years as a celebrity gunslinger at Tweetsie Railroad. The Billboard for May 31, 1952 offers an obituary for the mother of Chris C. Jernigan, a widely-known outdoor showman from the Airport Amusement Park. The July 2, 1955 Billboard lists the birth of Paula Faith to Mr. and Mrs. G. (Red) Normandin. Mr. Normandin operated the pony ride at the Airport Amusement Park. Howard Robbins was listed as the manager of the park in the April, 13, 1957, Billboard. The park is listed as having 8 major rides. Games, quick food and drink, restaurant, picnic area, free acts and fireworks are noted. The Airport Amusement Park is listed in the 1958 Billboard with Partlow as the manager. The park boasts 14 major and 6 kiddie rides, 10 games, 3 refreshment stands, a shooting arcade, athletic field, zoo, picnic area, vaudeville and fireworks. The End of the Airport Amusement Park? A 1956 classified in Billboard lists a Kiddie Mangel Whip for sale for $600.00. The whip was in operation while being sold. There is a mention from June 20, 1957 from the Statesville Record and Landmark reports that Sheriff Rumple did not get an invitation to bring the orphan kids to the Charlotte park. Is this leading to a decline in the park’s profits? Airport Amusement Park on the Auction Block! Airport Park equipment went on the auction block on Saturday (21), with interest in the equipment being expressed from as far away as Houston, TX. The park had been operated for 20 years by Barney Partlow, 72, and nephew Jack Partlow, who has other ride interests plus managership of the Spindle Center Fair in Gastonia. The elder Partlow said the 11-odd acres had been bought by the Godley Auction Company, which supervised the equipment sale. Up for sale went nine rides, a bingo, shooting gallery, popcorn, candy apple and the concession equipment, refreshment grille and ice cream stand. Barney Partlow lives about two miles from Airport Park, while Jack makes his home in Rock Hill, S.C. Kiddie rides in Park Center shopping development are part of his current business operation. Ernest Jonhson, organist in the Dogwood Room at the Charlotte Airport Terminal, and his sister, Erleen Marquandt, wrote a song entitled “Vicki”. Where’s Vicky? Anybody seen Vicki, Vicki? Anybody seen and elephant? Anybody seen a trunk? She’s been gone since dawning, And now it’s way past dusk. I think she went that-a-way, saw her go through the trees. But she’s disappeared into the woods. Guess she’s gone with the breeze. Days pass by and still no Vicki, What are we going to do? Vicki tried to be a little tricky, Vicki, Vicki, though she’d pull a quicky. Vicki, Vicki, Vicki got so homesicky, so she packed her trunk up and took a trip one day. Vicki had a lot of strength and power, Vicki took her ivory tower. Than to make a jungle out of Carolina. She’d practiced on her trumpet so no one could hear a melody mean for an elephant ear. Vicki found children ’round to pet her. Vicki, Vicki thought the city would be better. Vicki, Vicki, Vicki let the hunters get her. Then she packed her trunk up and came home to stay. Who knew there was a song written about a runaway elephant! Do you have any information about the Airport Amusement Park in Charlotte? Video Review of the Art of The Last Jedi Book!